The principle of a home battery system is very simple, but there are some interesting nuances, particularly seasonal behaviour which are worthy of further explanation. In order to understand the benefits of a home battery system, it is first necessary to understand what you are using. 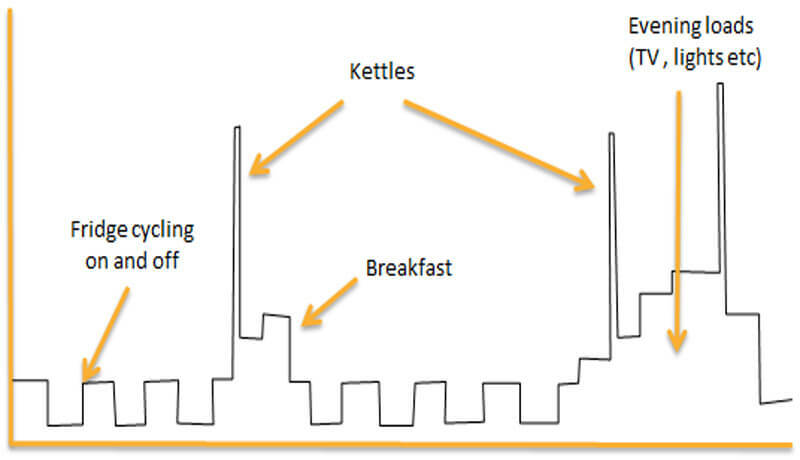 Electricity use within an individual home tends to be very spiky, especially when high-powered appliances such as kettles are used. We also see higher usage when the house is occupied, which, as shown for a working family, will be predominantly at breakfast and in the evening. This is when lighting and other appliances such as TVs, consumer electronics are on. 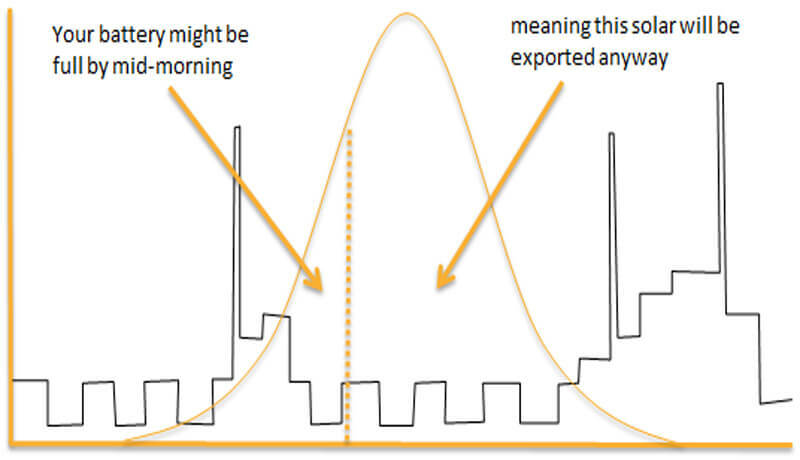 This typical profile isn’t very well matched to solar generation, unfortunately, and working households with solar will be exporting the majority of their solar generation. We estimate only 30% of solar generated electricity is used within the home. It’s only natural to want to use more of your own solar generated electricity, and batteries allow you to do this. They can increase the level of self-consumption up to about 70%. Batteries capture solar electricity that would otherwise have been exported back to the grid. 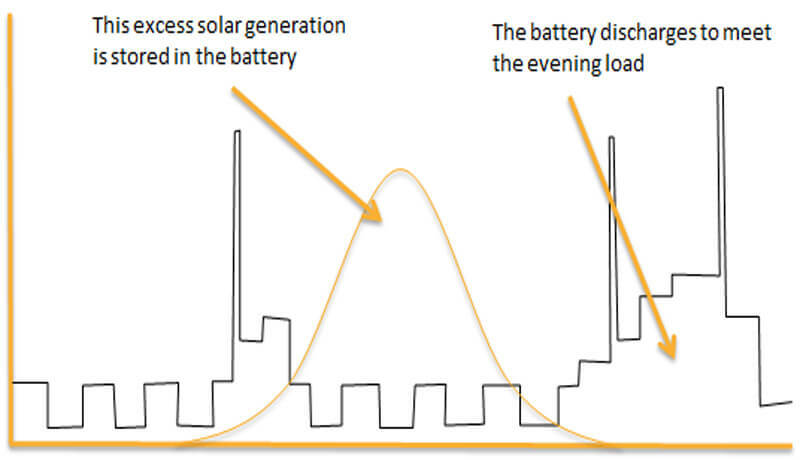 Once the sun has gone down, the battery can discharge to meet evening and night-time loads, so you can use your solar electricity throughout the day. So far, so simple! However, in the summer in the UK we receive about 8 times as much solar energy as we do in the middle of winter. It’s important you understand what your battery can and can’t do at different times of year. In summer, your PV system will be producing lots of energy – so you might find your home battery system is full by the middle of the day. After this point, any solar electricity is exported as it would be with just a straight solar PV system. This means you can never 100% capture all your solar electricity. 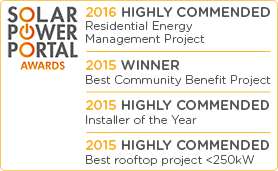 We think you will be able to capture about 70% of your solar electricity over the year. But beware – anyone telling you can get 100% capture is mis-selling to you. The battery will be full by evening of course, and if correctly sized will meet your evening peak usage and throughout the night as well. In summer your use of grid electricity could be almost zero. In winter, we have the opposite problem. With low levels of generation, your solar might only just cover the load in the house during the day. 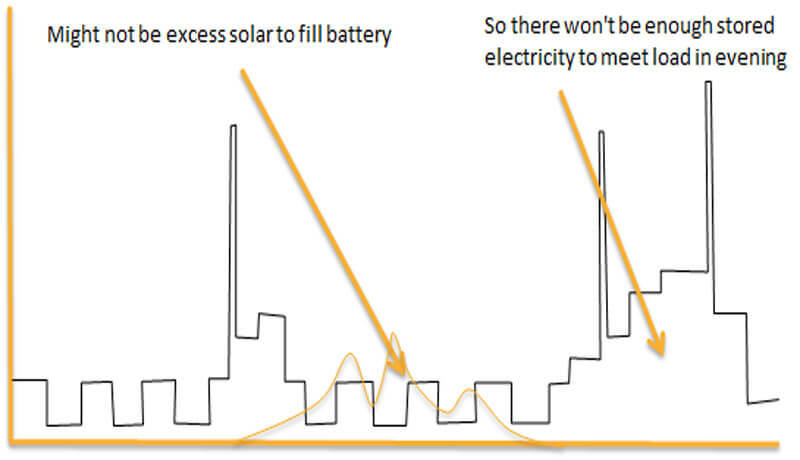 There will be very little excess solar to fill the battery, so you might not have energy stored to meet evening demand. This means you can’t be self-sufficient off your solar. We’re often asked if you can go off-grid completely! It is for this reason that you can’t in the UK – you are going to need to import electricity from the grid on winter evenings and nights.